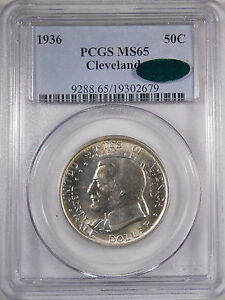 This half dollar celebrates the one-hundredth anniversary of Cleveland, Ohio's incorporation as a city, as well as the Great Lakes Exposition staged during 1936-37 in honor of Cleveland's centennial. 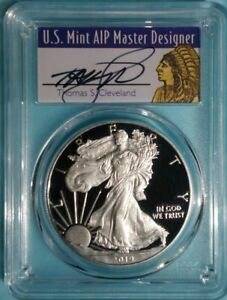 In that respect, it's a perfectly legitimate commemorative coin issue; some may argue, however, that the event was not really worthy of recognition on a United States coin. What really raised eyebrows at the time, however, was the involvement of one Thomas G. Melish of Cincinnati. 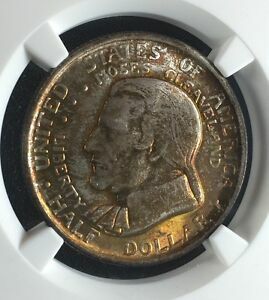 A tireless promoter of new commemorative coins, it was Melish who previously contrived to have the Cincinnati half dollar coined, an issue which had no legitimate foundation whatsoever. Celebrating a fictitious anniversary which commemorated nothing of substance, and it featured a portrait of composer Stephen Foster, whose connection with the city of Cincinnati had been peripheral, at best. 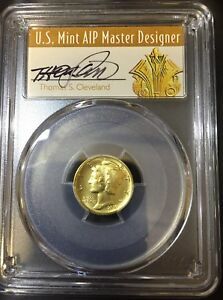 Branded by many observers as simply a profit-making racket for Melish, it was this same individual who now served as treasurer for the Cleveland Centennial Commemorative Coin Association, an organization of which he may have been the sole member. "It seems strange that Mr. Melish, living in Cincinnati, should be the distributor of the Cleveland issue" remarked Numismatic Scrapbook Magazine Editor Lee F. Hewitt in the May 1936 issue. 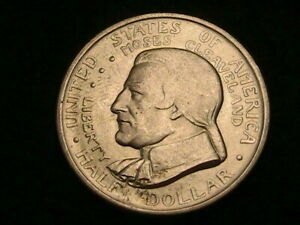 The Cleveland half dollar celebrates that city's centennial of incorporation, although it was actually founded in 1796. Settled on land along the southern shore of Lake Erie at the mouth of the Cuyahoga River, Cleveland was a part of the so-called "Western Reserve." This title referred to land in northeast Ohio that was still claimed by the state of Connecticut! The old colonial charters had given each colony the lands "to the west," without any specific terminus, and Connecticut was the last of the states to surrender its claims in 1800. By then the area in and around what is now Cleveland had been settled by many Connecticut farmers whose lands were burned by the British during the War of Independence. This land was given to them by the state of Connecticut in compensation for their sacrifice. That portion of the Western Reserve which remained was purchased by the Connecticut Land Company in 1795. Among its surveyors was one Moses Cleaveland, who laid out the settlement which bears his name (the first ‘a' was dropped by the city around 1830). Ironically, the group of 50 immigrants who followed Cleaveland to Ohio was not from Connecticut but from Schenectady, New York. Born in Canterbury, Connecticut in 1754, Cleaveland participated in the War of Independence and was eventually named a brigadier general in the United States Army. In addition to his adventures as a surveyor, he studied law at Yale and pursued this field as a career. He later served in the Connecticut state legislature, dying in 1806 at the age of just 52. The Cleveland Centennial and Great Lakes Exposition was held June 27 to October 4, 1936, reopening for a second season in 1937. 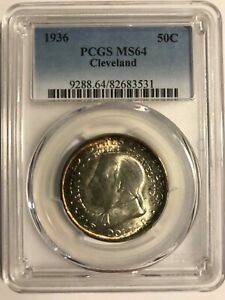 Honoring the city of Cleveland and the industrial achievements of the Great Lakes region, it apparently had no official connection with the Cleveland/Great Lakes half dollar, although specimens of the coin were sold there. 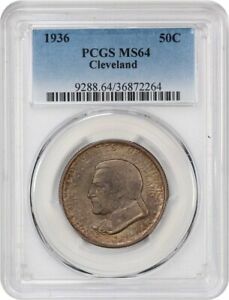 The act which authorized the coining of not less than 25,000 nor more than 50,000 Cleveland halves was modified several times before its passage on May 5, 1936. Introduced several weeks earlier at the prompting of Thomas G. Melish, it originally called for the striking of multiple designs honoring Cleveland and the Great Lakes Exposition. When this was not achieved, Melish sought to have part of the issue coined in 1937 with that additional date as an inducement for collectors to buy both varieties. Congress, wary of such tactics, refused to comply, and the final bill called for a single design coined at a single mint. 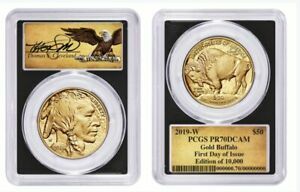 Selected to prepare models for this coin was Brenda Putnam, whose sketches were submitted to the Federal Commission of Fine Arts on May 1, 1936 by Mint Director Nellie Tayloe Ross. 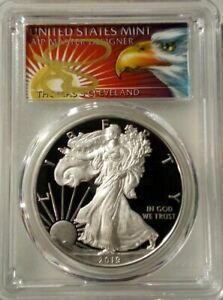 These sketches are very similar to the coin as made. The few revisions reflect the advice of the commission's sculptor member, Lee Lawrie, who suggested that stars representing the Great Lakes cities be substituted in place of actual city skylines. Aside from this comment, Lawrie and the commission as a whole were pleased with Putnam's design, and they gave their approval on June 2, 1936. In a letter to Lawrie, commission President Charles Moore couldn't resist poking some fun at the whole commemorative mania, which was then at its peak: "I am convinced that the whole movement is a coin-collector's racket that is going on all over the country . 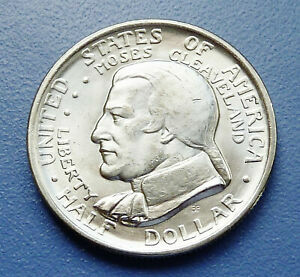 . ."
The obverse of the Cleveland half features a portrait bust of Moses Cleaveland facing left. Surrounding this are his name and the motto LIBERTY, the two inscriptions arranged in arc form and separated by three stars. 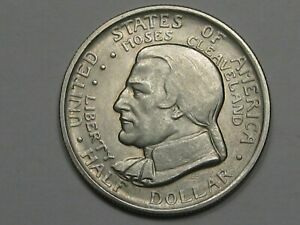 Arranged in peripheral arcs are UNITED STATES OF AMERICA above and HALF DOLLAR below, these separated by more ornamental dots. The sculptor's initials BP are found below the bust. On the reverse of the Cleveland half is an aerial view of the five Great Lakes. Nine stars representing the major lake port cities appear in their respective positions. A compass is placed above them, with its axis pointing toward the largest star, Cleveland. 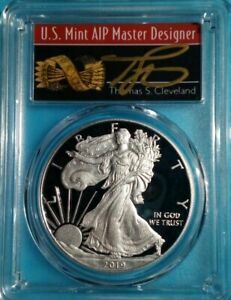 The statutory mottoes IN GOD WE TRUST and E PLURIBUS UNUM appear in the field. Around the periphery are GREAT LAKES EXPOSITION and CLEVELAND CENTENNIAL, separated by the tiny dates 1836 and 1936. 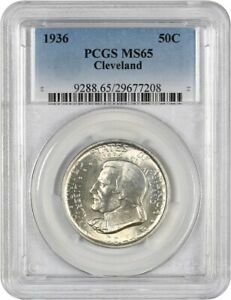 The first 25,000 Cleveland half dollars were minted in July of 1936, with an additional 15 pieces reserved for the Assay Commission. 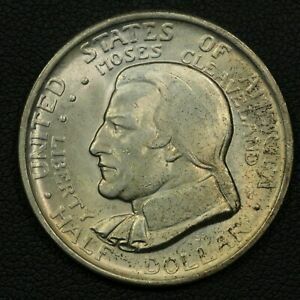 Offered on the exposition grounds at $1.50 per coin or sold through the mail at $1.65 postpaid, these halves proved popular enough to justify coining the balance of the pieces authorized. This request for additional pieces came in February 1937, yet the authorizing bill precluded changing the coins' date; both strikings are identical. The 25,015 coined in 1937 included another 15 piece reserved for assay and later destroyed, leaving a net mintage of 50,000 for this type. 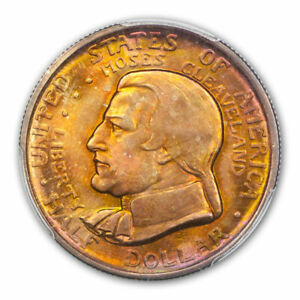 Although Melish boasted of great sales and warned collectors to hurry with their orders lest they be disappointed, many coins remained unsold at the end of the centennial celebrations. 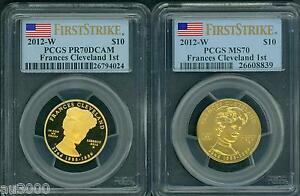 These were purchased in quantity by dealers at prices just slightly above face value. No large hoards survive today, but the re-emergence of an occasional roll is not unknown. 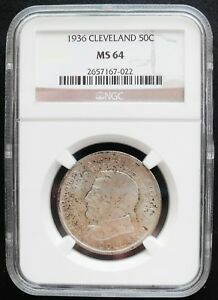 This coin is plentiful in mint state, with most coins grading MS-60 through MS-64. Gem examples graded MS-65 and MS-66 are not especially rare, but higher-grade specimens are very elusive. Cleveland halves were sold to the general public, as well as collectors, and many are found with signs of abuse. These will grade EF-40 through AU-58 and may have been cleaned or otherwise mishandled. Points to check for wear include Cleaveland's cheekbone and the hair behind his ear, as well as the top of the compass. 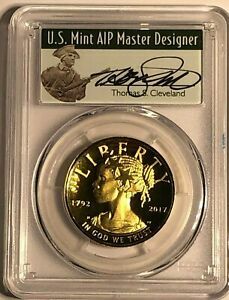 The first 201 coins struck were placed in numbered and notarized holders, signed by Melish and certifying their special status. 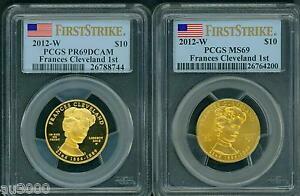 These typically are better struck and have fewer contact marks than those that received no special handling. 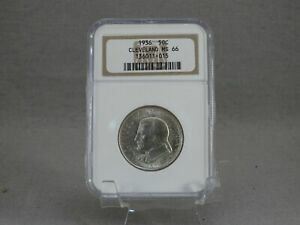 In 1941, 100 ordinary Cleveland halves were counter stamped on both sides by the Western Reserve Numismatic Club to mark its 20th anniversary. 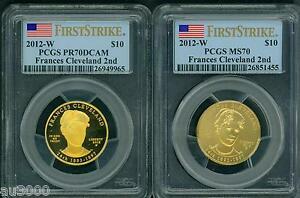 30 years later, the club again counter stamped Cleveland halves in honor of its golden anniversary. This time, however, no more than 15 pieces were made. 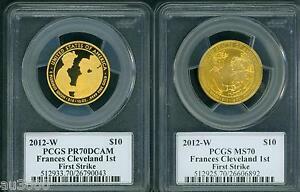 Although not an official Mint product, these counter stamped halves are eagerly sought by commemorative collectors. 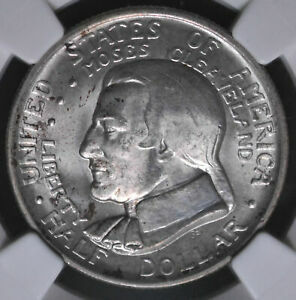 1936 CLEVELAND 50 CENTS NGC MS 64 CHOICE SILVER COIN .